Filed to: and always twirling twirling twirling towards... something!Filed to: and always twirling twirling twirling towards... something! and always twirling twirling twirling towards... something! The Facebook War Room, which appears to have been more of a temporarily booked conference room. 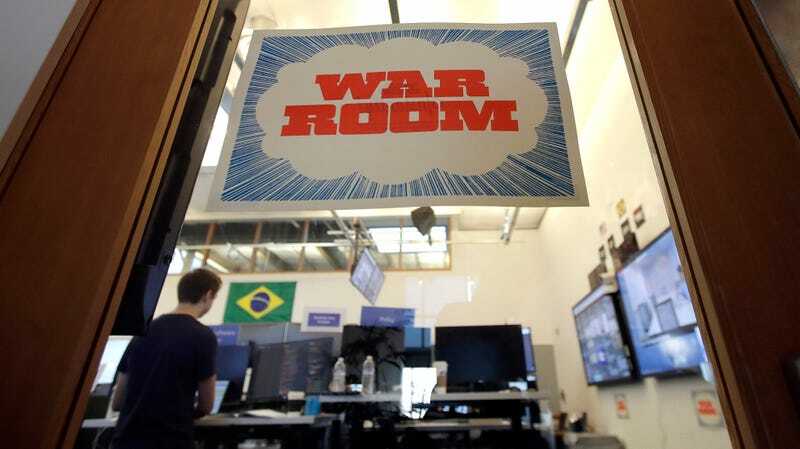 Facebook’s so-called “War Room,” the office it set up with some monitors and staff to supposedly fight propaganda and disinformation during elections or at least fight the perception it wasn’t doing that, has been shuttered—in that form, anyhow. Two months ago, Facebook showed off a “War Room” that brought employees from different teams together to quickly spot and fix issues like misinformation during the U.S. midterm elections. At the time, the company said the War Room might be deployed for future elections. But it’s been disbanded. Facebook says it was never intended to be permanent, and the company is still assessing what is needed for future elections. Following the publication of this story, the company changed its statement: Facebook will still use War Room tactics, like spotting disturbing trends in user activity, for future elections, but has not yet decided which elections are significant enough to create a physical gathering area. In a further statement to TechCrunch, Facebook said that “Our war room effort is focused specifically on elections-related issues and is designed to rapidly respond to threats such as voter suppression efforts and civic-related misinformation. It was an effective effort during the recent U.S. and Brazil elections, and we are planning to expand the effort going forward for elections around the globe.” Elsewhere, Facebook VP of product Guy Rosen tweeted that the company plans on actually expanding its anti-propaganda efforts, even if the physical room itself is currently empty. Facebook is currently festering with controversy surrounding not just the use of its platforms (including subsidiaries like encrypted chat service WhatsApp) to spread hoax news, propaganda, and myriad agitprop for political purposes, but also its handling of user data and ill-advised campaigns against critics like billionaire philanthropist and Holocaust survivor George Soros. While the War Room earned it some favorable coverage at a time when even internal morale is reportedly not so hot, it doesn’t seem to have done very well in Brazil, and a recent report in Rolling Stone highlighted a growing perception that Facebook’s efforts have been arbitrary responses to outside political pressure. In other words, Facebook’s sprawling global expansion may have left it too large and chaotic, the problems too many and complicated, and the potential backlash too headache-inducing, for any real solution to be on the horizon. CEO Mark Zuckerberg reportedly recently told employees that the company is “at war,” and though against who and to achieve what objectives increasingly seems to depend on what day of the week it is, co-opting military buzzwords appears to be a big part of the strategy. Per Bloomberg, a Facebook spokesperson touted yet another solution, a “strategic response team” that would bring crises to Sandberg’s attention before they spiral out of control.